Skepticism abounds when someone makes a claim as outlandish as Elon Musk’s assertion that the new Tesla Roadster will scoot to 60 mph in 1.9 seconds and manage a range of 620 miles. So I spoke with a battery researcher from Carnegie Mellon to break it down and see how feasible all this really is. 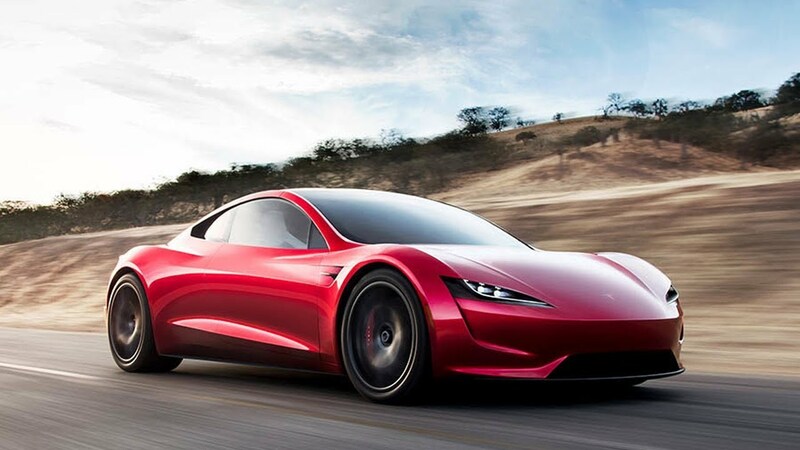 When introducing the new Tesla Roadster, Musk himself said, “these numbers sound unreal but they’re not.” And while a sub-two second zero to 60 mph time and a 1,000 km range are both impressive, they really shouldn’t sound “unreal.” According to a battery researcher I spoke with, the figures actually seem reasonable. There isn’t a production car today that can reach 60 mph in under two seconds. The Tesla Model S has been known to hit that mark in around 2.4 seconds, and though that may not seem far from the 1.9 second claim on the Roadster, half a second is quite a lot of time to shave. But there are automobiles out there known to reach 60 mph in under two seconds—among them are rally cars. As Jason Fenske from Engineering Explained points out, the key ingredients that a rally car uses to rocket to 60 mph in 1.9 seconds are a 600 horsepower engine, fancy limited slip differentials for the all-wheel drive system, and special tires and a sub 3,000-pound curb weight. The Tesla Roadster is likely to use some of these same enablers to achieve its quick sprint. It has electric motors powering all four wheels—motors that can be precisely controlled to maximize traction. Those motors also likely put out absurd power numbers (I’d guess much more power than the 600 ponies that rally car’s little 2.0-liter turbo churns out). To learn more about how the Roadster could reach rally car-like acceleration figures, I spoke with Carnegie Mellon’s Venkat Viswanathan, a mechanical engineering assistant professor who works at the Wilton E. Scott Institute for Energy Innovation and focuses on next-generation battery technology. He’s also published studies on battery technology. He told me he thinks the 1.9-second figure actually seems reasonable. The most interesting thing he said is that Tesla’s claimed battery capacity of 200 kWh isn’t just there to contribute to a higher cruising range, but it’s also an enabler for fast acceleration times. So that big battery pack with all of its cells could be a key enabler to get more power to those motors, which means better acceleration and a higher top speed. Of course, weight is also a factor, and on that front, Viswanathan told me his team at Carnegie Mellon uses 240 watt-hour per kilogram as the assumption for specific energy on the most modern battery cells. Considering the new Roadster’s battery pack capacity claim of 200 kWh, this translates to a battery weight of 833 kg, or roughly 1,800 pounds. That’s not light, but on a per Watt-hour basis, that’s a huge advance from its predecessor, Viswanathan tells me. I couldn’t find its specific energy from a reputable source though multiple websites say it’s a very low 117 Wh/kg. So the new Roadster isn’t likely to be as featherweight as those rallycross cars in the video above, but it could—with clever use of lightweight materials—still come under the nearly two-ton curb weight of the Nissan GT-R, which remains an acceleration benchmark among sports cars. Not to mention, unlike the GT-R or the rally car, the Tesla won’t have any gears to shift, and it’s likely going to make significantly more torque low in the rev range. So really, 1.9 seconds to 60 mph seems doable, as does the top speed, though, as Viswanathan told me, the feasibility of those claims really all depends on the tires. If they can get enough grip and hold up at high speeds and loads, that Tesla could launch like a rocket up to an impressive top speed. 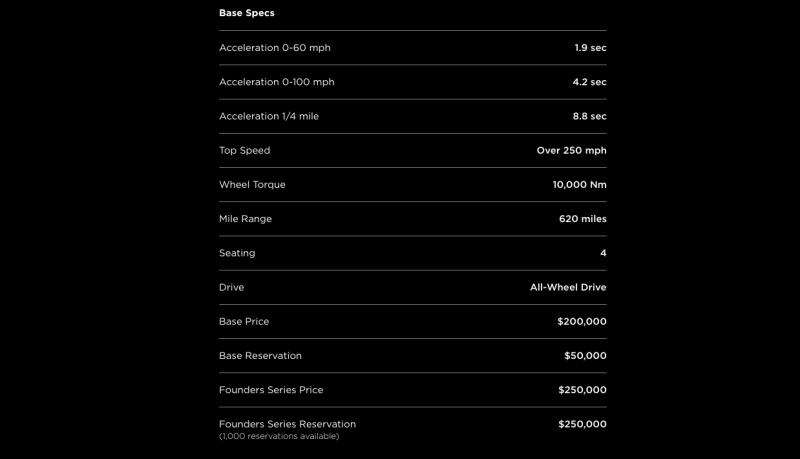 If Tesla can keep drag coefficient down to the low 0.2s like it has with the Model S (which has a 100 kWh pack and a range of 315 miles), the little roadster could very well hit that 620 mile figure—a range that, it’s worth noting, almost certainly applies only to steady-state driving conditions, where weight isn’t such a big factor. So yes, the numbers may, upon initial glance, seem astronomical. But, based on my discussion with one battery researcher, the small $250,000 car with a 200 kWh battery pack coming from a company with a history of high-performance EVs might actually pull it off.